The following notices are to ensure you are informed of important issues regarding your cleaning job. When cleaning urine spots, there is a difference between cleaning the urine soiling and treating for odor. Cleaning existing urine spots MAY NOT remove any associated odor. In fact, could INCREASE the odor in the air space for a temporary period of time. WE HAVE TWO ODOR TREATMENT OPTIONS AVAILABLE. *This means that no one can guarantee complete removal of all urine spots. Please consult with your technician for available pet odor treatments options. If you have light colored carpet, you may have experienced dark around baseboards, under doors, and especially near the HVAC return. This soiling comes from air passing through the carpet as it is attempting to go through the edge of the carpet pile, microscopic particles of soil are deposited there (hence the term filtration soiling). This occurs over a significant period of time and is not noticed until a buildup has occurred. 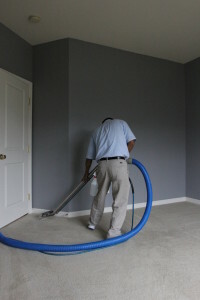 This type of soiling is difficult to remove because the soil particles are so fine that they penetrate deep into the carpet pile, sometimes into the backing of the carpet. Can it be removed? Sometimes, with special products, time, and effort reasonable results can be achieved, although not in all cases. To help prevent filtration soiling in the future, vacuum the edges of the carpeting on a regular basis, then wipe with a damp, white terry cloth towel. Be careful around the tack-strip under the edge of the carpeting, you could nick your fingers!